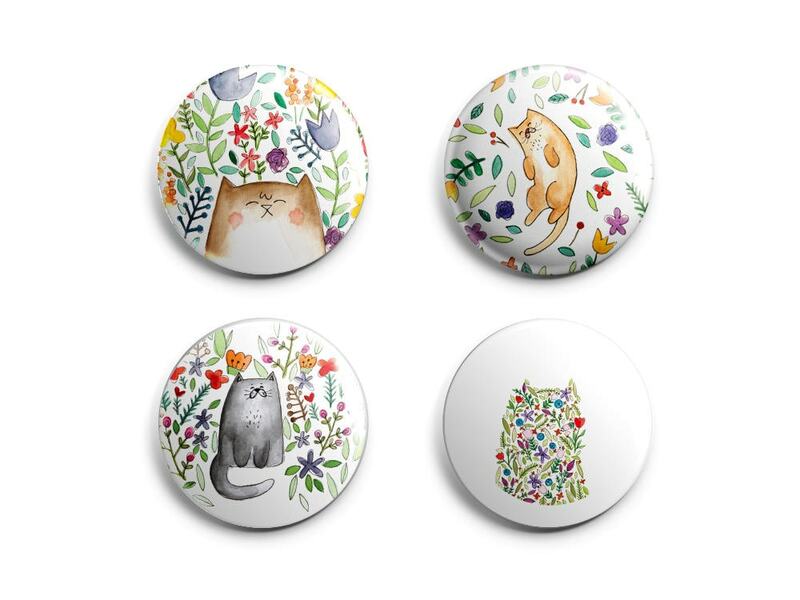 A cute cat and flower set of magnets or pins, featuring a floral watercolor design from my original paintings—perfect for lockers, office whiteboards, refrigerators, backpacks and more. + 4 colorful floral cat images from my original watercolor paintings. + Unique gift for cat lovers. + Packaged in convenient resealable bag (minimal waste). These magnets are so adorable! The person I sent them to as a gift absolutely loved them!! I sent these as a secret santa gift. I had marked "this is a gift" during checkout but didn't include a message. The seller reached out to me to see if I wanted to include a note since she had noticed I marked "gift". Such great customer service!! Super cute! Perfect gift for a cat lover! Better than I expected and lightening fast delivery! You are truly talented! !